AMC made a bunch of cool muscle cars back in the '60's and '70's. One of their coolest was the 1970 Rebel "The Machine." Based on their swoppy, new for 1970 Rebel SST sedan, "The Machine" was an option package that featured a special high-performance 390 ci. - 340 hp V8. This was the most powerful engine AMC would ever offer in a regular production vehicle. 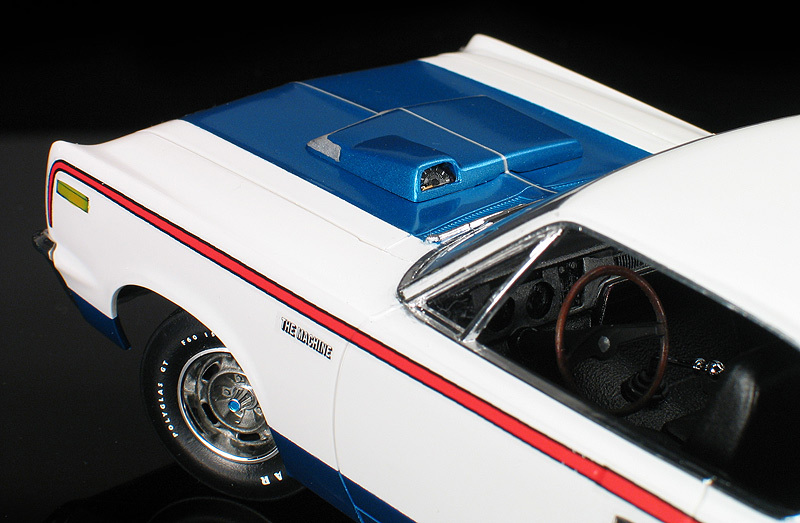 The car also had a unique hood scoop with intergrated tachometer, a hurst-shifted 4-speed, rallye wheels and a trademark AMC patriotic red, white and blue paint scheme. 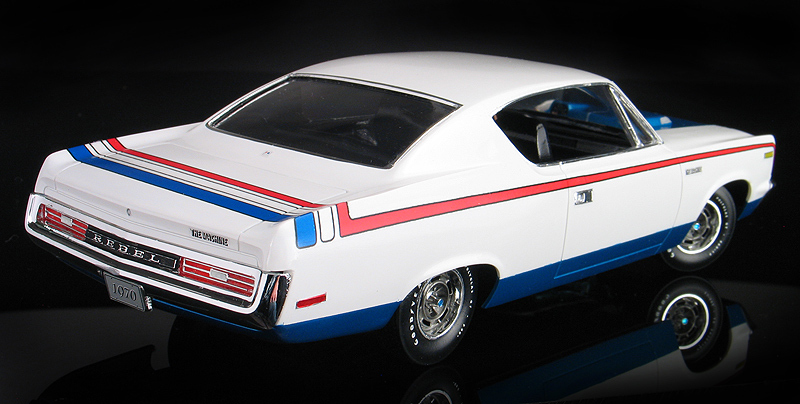 Johan made 1/25 scale model kits of the 1970 American Motors Rebel "The Machine" back when the real cars were new. These kits are hard to find and cherished by collectors now. I bought my kit more that 20 years ago and it was minty fresh when I broke the seal on the box and decided to build it. I know there is a kit collector someone with tears in his eyes, but I buy kits to build, so that's what I did. I built my example straight from the box with a couple of small exceptions. The decals in the Johan kit were pretty crude looking. Johan quality control was not always the greatest and my decal sheet was blotchy and the color weren't registered correctly. I decided to upgrade to a set of corrected Keith Marks decals. These are much nicer and also have all the little emblems on the sheet. One notible decal missing though was the thin silver center stripe down the hood. I combed through parts box and turned up a suitable silver stripe which I cut from the optional hood stripes from the decal sheet of an AMT '70 Z-28 kit. Also, I created my own artwork for the Goodyear Polyglass GT white letter tires and had a custom set of dry transfers made. Lastly, I swapped out the kit's crude looking original generic tires for a set of better looking ones from the AMT/Ertl '71 Charger kit. 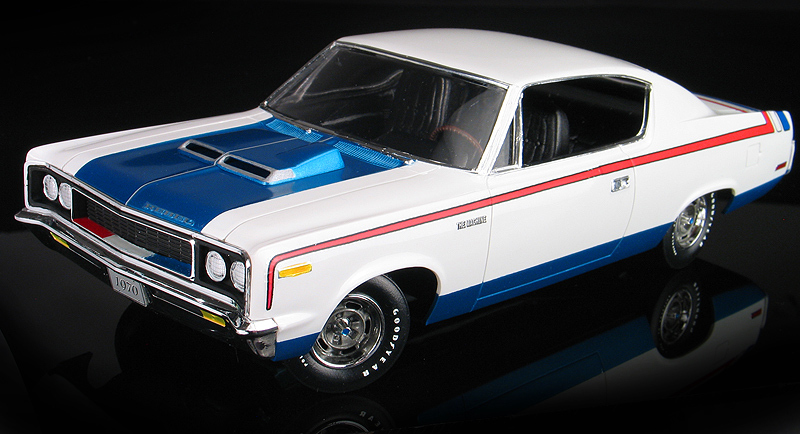 The paint is Tamiya bright white with their light metallic blue sprayed on the hood and rocker panels. It was a simple and fun-to-build kit and now I have another piece of iconic Johan AMC muscle in my collection.